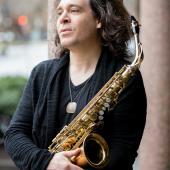 Philipp A. Stäudlin is an award-winning virtuoso saxophonist that has performed hundreds of concerts throughout North America, Europe and Japan. His characteristic tonal qualities, deep sense of phrasing and superb technical skills make him one of the most unique voices in today's classical saxophone world. A native from Friedrichshafen, Germany, Stäudlin has appeared as a soloist with the Sinfonieorchester Basel, Boston Modern Orchestra Project (BMOP), Ensemble Sound Icon, Ensemble White Rabbit, Niederrheinische Sinfoniker, Callithumpian Consort, Bielefelder Philharmoniker, Harvard-Radcliffe Collegium Musicum, Tufts University Orchestra, Northwest Florida Symphony Orchestra, and The Providence Singers. Stäudlin has also performed with the Harvard Group for New Music, Equilibrium Ensemble, ECCE, Talea Ensemble, Steamboat Switzerland, Dinosaur Annex, Ensemble White Rabbit (former ensemble in Residence at Harvard University), Ludovico Ensemble, IGNM Basel, Alea III, Back Bay Chorale, and many others. A graduate of Musikhochschule Basel, Stäudlin received a Soloist Diploma, having studied with Marcus Weiss and Iwan Roth. He was awarded a full scholarship two years in a row from the German Academic Exchange Service (DAAD) to study with Kenneth Radnofsky at the Longy School of Music of Bard College, where he received an Artist Diploma, as well as the Victor Rosenbaum Medal for the "most outstanding student." Mr. Stäudlin has won many awards as both a saxophone soloist and chamber musician. As the youngest competitor, Stäudlin won First Prize and Audience Prize in the Gustav Bumcke International Saxophone Competition. As a former member of the New Art Saxophone Quartet he has received First Prize in the Chamber Music Competition of the German Music Foundation and the Artist in Residence newcomer’s award with German Radio, in which Jessye Norman received the main award. The New Art Saxophone Quartet was invited to be the representative of German musical culture on a visit to South Korea and Mongolia with Bundespresident Roman Herzog. Philipp A. Stäudlin currently has 15 CD recordings available on New World Records, Tzadik, Albany Records, Innova Records, Suspicious Motives Records, New Focus Recordings, Navona Records, Newport Classics labels, Enja, and Ars Musici. He is a member of Ensemble Sound Icon, Callithumpian Consort, and the Equilibrium Ensemble. Stäudlin premiered more than 100 works. Philipp A. Stäudlin is a member of Ensemble Sound Icon, Callithumpian Consort, and teaches saxophone at The Boston Conservatory at Berklee in both the standard degree and contemporary music programs, and is also on the applied music faculty at Tufts University and Massachusetts Institute of Technology (MIT). He lives with his wife, pianist Yoko Hagino, and their daughter Anna in Melrose, Massachusetts.